A step towards a U.S. cluster munitions ban? (2) the agreement applicable to the assistance, transfer, or sale of the cluster munitions or cluster munitions technology specifies that the cluster munitions will only be used against clearly defined military targets and will not be used where civilians are known to be present. A similar restriction on the export of cluster munitions was first introduced in the 2008 Consolidated Appropriations Act in December 2007. Compared to the 2008 Act, this year’s law represents advancement, but some of its wording calls for further clarification. Questions arise in particular regarding the ‘agreements’ concluded with the recipients of US cluster munition exports. These agreements usually not being public, how will recipients’ compliance be assessed and how will they be held accountable if they do not respect the terms of the agreement? As to the content of these agreements, what is meant by ‘clearly defined military targets’, for instance? Will recipients be held to the generally accepted standards on the conduct of hostilities and the definition of a ‘military objective’ contained in Additional Protocol I to the 1949 Geneva Conventions - a treaty that the U.S. has never ratified? Further, the phrase ‘where civilians are known to be present’ raises questions about the level of knowledge that is required at any time during and preceding an attack. Will it for instance be in order to use cluster munitions where civilians are possibly or probably present? What measures does the attacker have to take to ascertain whether there are civilians in the area? And if there are civilians, can the attacker assume that they are no longer present after they have been warned of an impending attack? Apart from these open questions, the 2009 Act introduces a more restrictive export policy, notably due to the reformulation of the 1% failure rate criterion. Whereas in 2008, cluster munitions had to have a ‘99 percent or higher tested rate’ to be exportable, now, they have to have a ‘99 percent or higher functioning rate’. The term ‘functioning rate’ was already used in the Cluster Munitions Civilian Protection Act (a bill aimed at limiting the use, sale, and transfer of cluster munitions) that was introduced by Senators Feinstein and Leahy in February 2007 (and which was stalled in the various Committees of the Senate and House of Representatives). The 99 % functionning rate criterion limits exportable cluster munitions to those that in actual combat situations produce no more than 1% duds, as opposed to the failure rates measured under the ideal conditions of a test. But how the ‘functioning rate’ of a cluster munition will exactly be determined and by whom remains to be seen. The U.S. delegation introduced similar wording into the text that the Convention on Certain Conventional Weapons’ (CCW) Group of Governmental Experts (GGE) is discussing in Geneva. And the 2009 bill for a Cluster Munitions Civilian Protection Act introduced in the U.S. Senate on February 11 this year also uses the phrase ‘range of intended operational environments’. This formulation of the reliability criterion suggests that the failure rate is calculated on the basis of instances of cluster munitions use in different terrains and weather conditions. It does beg the question, however, what ‘unintended operational environments’ are. Another part of the phrase also gives rise to concern. In fact, it seems to address only those submunitions (or depending on the reading, cluster munitions) that, after arming, do not result in more than 1% dud rate. This would mean that submunitions that for various reasons fail to arm during descent (respectively, those cluster munitions that fail to disperse their load) do not enter the 1% calculus. However, unarmed submunitions (whether dispersed or not) also represent a danger to civilians. Years after their deployment, movement can cause them to arm - and detonate. Participants in the Oslo Process on Cluster Munitions that led to the successful adoption of the Convention on Cluster Munitions (CCM) in May last year, have recognized that the reliability of cluster munitions depends on a multitude of factors and is difficult to determine in a universally acceptable, objective way. Therefore, the CCM’s approach has been to address all the criteria that have in practice caused the unreliability and indiscriminate effects of cluster munitions. The CCW GGE, in contrast, continues to grapple with failure rates. But in practice, the U.S. 1% failure rate policy, whatever its formulation, is tantamount to a de facto export ban on ‘cluster munitions causing unacceptable harm to civilians’ because ‘only a very tiny fraction of the cluster munitions in the U.S. arsenal meet the 1-percent standard’. The other major step towards an export ban on cluster munitions lies in the fact that the export limitation in the 2009 Appropriations Act may well be a permanent one. In difference to the export restriction of the 2008 Consolidated Appropriations Act, which was only valid for the duration of fiscal year 2008, the 2009 Act contains no such time limit. How U.S. policy on the use of cluster munitions, as opposed to their export, will shape up is still unclear. Supporters of a complete ban on cluster munitions are working toward motivating Senators to co-sponsor the recently introduced Cluster Munitions Civilian Protection Act of 2009. They hope that growing co-sponsorship of this legislation might in time encourage President Obama to join the CCM. Maya Brehm, with thanks to Laura Chirot and Virgil Wiebe for their helpful comments. 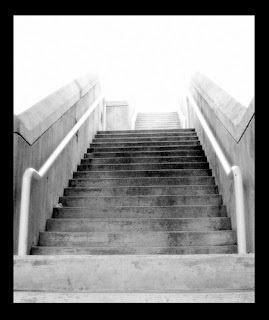 Photo Credit: 'Go toward the light' by J.Star on Flickr. Labels: arms trade, Brehm, cluster munitions, Convention on Cluster Munitions, Group of Governmental Experts, U.S. Earlier this week, the Lao People's Democratic Republic ratified the 2008 Convention on Cluster Munitions (CCM) at a special event in New York at United Nations Headquarters. Lao PDR’s accession to the CCM is significant not least because this South East Asian nation is the most heavily affected country in the world from unexploded submunitions due to a secret American bombing campaign in the 1960s and 1970s that pulverised entire areas of the country such as the Plain of Jars. A generation on, and Lao PDR’s people – the majority of them not even born during the bombing period – are saddled with a deadly legacy of unexploded ‘bombies’ (submunitions) in their fields, rivers and woods that threaten livelihoods and their very lives. The figures are staggering. Lao PDR’s National Unexploded Ordnance Programme believes that, even under ideal firing conditions, at least 30 percent of the more than 260 million submunitions dropped on the country during the Indochina War would have failed to function as intended, leaving an estimated 78 million bombies to pose hazard to people going about their daily lives. Fifteen of Lao’s seventeen provinces were left affected by cluster munitions and other unexploded ordnance, and today ten provinces are still severely infested – with an estimated 300 people injured or killed per year. As such, Lao PDR is always going to be a special case for the new treaty. It is generally (if tacitly) recognised by others involved in the Oslo process that – even with the international assistance promised by other members of the CCM – Lao PDR is unlikely to achieve the treaty’s ten-year deadline for clearance and will eventually require an extension (as has just occurred in the Mine Ban Treaty context, for example, for certain countries that have not completed anti-personnel mine clearance activities for various reasons). But, hopefully, membership of the CCM will be a means to continually draw attention to and resources for post-conflict activities to reduce the hazards of unexploded submunitions and other ordnance on Laotian civilians. At the same ceremony, the Democratic Republic of the Congo – another cluster munition-affected country – signed the CCM, which makes it the 96th to do so. And Iraq made a statement indicating its intent to join the CCM once domestic steps have been completed. Also, a week earlier, on 11 March, the Mexican Senate approved that country’s ratification of the CCM. Although a country can provisionally apply the CCM at any time, to enter into force internationally the CCM needs to be ratified by 30 states. Less than five months after the CCM’s signing ceremony in Oslo last December, the treaty can already count on 6, and more will surely follow as 35 other states have publicly committed to ratify as soon as possible. As Iraq’s statement indicated, the number of signatories, which presently stands at 96, is also certain to increase soon. So far many of the world’s largest producers and users of cluster munitions remain outside of the treaty. But there were encouraging developments last week in the US. On 11 March, President Obama signed the Omnibus Appropriations Act for fiscal year 2009, already passed by Congress. It enacts a ban on American exports of most cluster munitions, and has been described as a “qualified ban”. Meanwhile, many members of both chambers of Congress have apparently cosponsored legislation to enact a ban on most cluster bombs – galvanised by Senators Patrick Leahy and Dianne Feinstein. And President Obama’s transition team are apparently studying the issue of whether the US should go the whole hog and join the CCM. We’ll seek to provide more analysis in coming weeks. Photo credit: Mary Wareham. 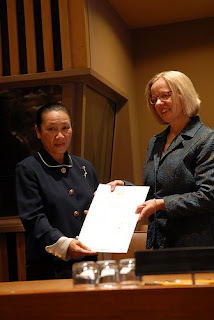 Ambassador Kanika Phommachanh, Permanent Representative of the Lao PDR to the UN in New York, depositing her government's ratification of the Convention on Cluster Munitions with the UN's Office of Legal Affairs represented by Treaty Section Chief Annebeth Rosenboom. Laos became the fifth state to ratify - a total of 30 are required for the treaty to enter into force. Lao reference: Lao PDR National Regulatory Authority, Lao National Unexploded Ordnance Programme and UNDP, Hazardous Ground: Cluster Munitions and UXO in the Lao PDR (2008). "Have opposable thumb - will Twitter." The Economist ran an interesting article in late February concerning the British anthropologist and evolutionary psychologist Robin Dunbar's hypothesis about primate neocortex size and Facebook. Dunbar’s hypothesis is not without its critics, including among other anthropologists. But recently The Economist teamed up with the in-house sociologist at social networking website Facebook, with its trove of data, to crunch some numbers and see if light could be shed on the validity of Dunbar’s idea. Their findings as detailed in The Economist’s article tend to confirm Dunbar’s hypothesis. The average number of “friends” in a Facebook network is around 120, and women tend to have somewhat more “friends” than men (although some Facebook members’ networks are far larger, of course. For the record: mine isn’t, and I seem to be somewhat under-endowed in the network size department. Ahem.). This would seem to equate with my own experience of Facebook; phrased another way: Facebook involves a lot of superficial social contact, but isn’t a good way to improve trust with “friends” I don’t know well already – my most active interactions are with people I already know well. Dunbar’s hypothesis was also of interest to me because previously on the Disarmament as Humanitarian Action project we’d observed that a lot of activity on the margins of negotiations seems to be as much about “social grooming” – that is, informal trust building – than about the direct exchange of information. Dunbar’s work provided a number of interesting ideas we explored in our last two volumes of work (see column at left). For example, negotiating processes tend to involve many hundreds of people. The sheer mechanics of managing this means that exchanges in conferences often become very set piece in terms of social interaction. In our third volume of articles on ‘Thinking Outside the Box in Multilateral Disarmament Negotiations’ we suggested that in conference diplomacy processes of sizes beyond the “Dunbar number”, cognitive difficulties for individuals in following evolving dynamics could become overwhelming. Therefore, an important part of evaluating what makes negotiations ‘successful’ should entail not only analysis of substantial political issues, but also some thought about the structural aspects of negotiators’ interactions since this can make things easier or harder. We described this as ‘cognitive ergonomics’, and explored it in greater detail as part of our recent publication on ‘The Value of Diversity in Multilateral Disarmament Work’. The general idea is that improving opportunities for dialogue and trust building at a face-to-face level should improve negotiators’ chances of success. And it links to arguments about perspective diversity from Scott E. Page and others that are highly relevant to group prediction and problem solving issues. I’ve noticed that many of my disarmament diplomat colleagues are pretty active Facebookers. Well and good, but as long as nobody sees it as a substitute for the face-to-face dimension of trust building in diplomatic work. In fact, I have my doubts whether Facebook is even a useful trust building supplement, as it doesn’t seem of much relevance beyond a broadcasting tool. But I predict that as the year unfolds and there are plenty of long disarmament-related conferences to sit through, Twitter is going to be the next thing many disarmers pick up on. I’m not a Twitterer, but I understand the idea is that you broadcast to other Twitterers on your network what you’re doing in messages of no more than 140 characters (“What are you doing?”). Ironically, Twitter might conceivably be good for diplomatic trust building if it dawns on enough people that they could be more productively using their time interacting in person in smaller groups outside the formal conference room than passively behind the nameplate. (“What am I doing? Same as you – sitting here. What the hell are we doing?”) Whatever happens, it’s hard to see newfangled technology winning out over the lure of coffee and cigarettes anytime soon. 'Chimp hand' by John_X downloaded from Flickr. His caption said: "Biologically, the chimpanzee is closely related to humans, so many of their characteristics may seem familiar. The most remarkable physical similarity between chimpanzees and humans is the opposable thumb. 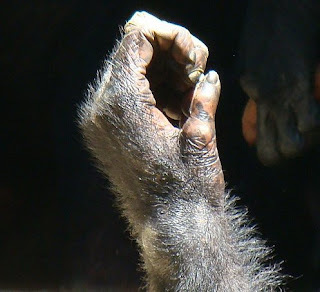 The thumb allows chimpanzees to grab objects and use tools much like we do. Unfortunately, chimpanzees are currently on the endangered species list. Populations have decreased because of foresting, hunting, commercial exportation, and collection for scientific research." Taken at the Los Angeles Zoo on June 18, 2008. Since many of our regular readers belong to what’s referred here as the ‘Geneva disarmament community’, it might be of interest to have a brief look at what their Swiss hosts have recently been up to on the weapons regulation front. As many who live in Switzerland are aware, Swiss citizens enjoy the right to ‘popular initiative’; that is, they can propose a change to the federal constitution and submit it to a nation-wide vote, provided they manage to collect 100’000 voter signatures within 18 months in support of the initiative. One such popular initiative recently managed to gather the required number of signatures and even made it into the foreign press.The initiative for the ‘protection against gun violence’ proposes stricter regulation in Swiss law of the private use, acquisition and carrying of weapons and munitions. It would require legislators to specify the licensing requirements for hunters, collectors, sportsmen and other professionals who wish to possess weapons, and calls for the establishment of a federal firearms registry. In addition, the law would oblige the federal authorities to advocate the reduction of small arms availability at the international level. But what has really caused a stir among the Swiss is that, outside of military service, army weapons would have to be deposited in secure military facilities. Switzerland has a militia army, and military service is (in principle) compulsory for men. It means that about 200’000 Swiss men undertake military service in annual courses of a few weeks in duration every year. Outside of this period, such men are required to keep their military weapon at home and cannot leave it in the military arsenal. Proponents of the initiative argue that to store military guns in cupboards or under the bed is not required for effective national defence. They say the practice can be connected to gun homicides and relatively high suicide rates in Switzerland. Nevertheless, the initiative strikes at the heart of the Swiss ‘keep-your-gun-at-home’ tradition. Opponents, including, naturally, the right wing Swiss People’s Party (SVP/UDC) see this as undermining the very foundations of the militia army (which plays an important role in Swiss national identity), and is thus a threat to the security, independence and sovereignty of the country. When exactly this initiative will be put to the vote – and whether Switzerland’s Parliament will present a counter-proposal – is yet to be decided. Another popular initiative, ‘against new fighter jets’, is currently at the stage of signature collection. If this initiative reaches the voting stage, the Swiss will have to decide on whether to impose a moratorium on the purchase of new fighter jets from 2010 until December 2019. The initiative was launched mainly with a view to decreasing Swiss military expenditure, but also because there is no possibility to call for a referendum once a decision on an armaments purchase has been made. Whether the committee initiating this effort will succeed in collecting the necessary signatures is unclear. It is worth recalling that an initiative ‘against the noise of fighter jets in tourism regions’ failed at the ballot in February last year, and several previous initiatives to limit the size of the Swiss army were also voted down. One initiative deposited successfully in 2007 called for a ‘prohibition on the export of war materials’. It obliges the federal authorities to support and further international disarmament and arms control efforts and it would prohibit the export of war materials (regulated by the ‘Swiss Federal Act on War Materials’), including small arms, light weapons and ammunition, and special military goods (subject to the Swiss ‘Goods Control Act’), as well as technologies that are of particular importance for the development and use of these goods. The brokering of the transfer of these goods to recipients abroad would also be prohibited. Exceptions are provided for mine clearance, sport and hunting devices, as well as weapons that Swiss authorities use abroad and re-import subsequently. The proponents of the initiative consider that Switzerland’s ‘business with death’ is at odds with the country's world-wide humanitarian engagement and peace promotion policies, and is also inconsistent with its claim to neutrality. Moreover, they express concern about the impact of this trade on international peace, security and sustainable development in recipient countries. The Federal Council has advised the Swiss Parliament to reject the initiative, though. Parliament has to take a decision by March 2010. Whereas the government acknowledges that an export ban on war materials would not have severe consequences for the Swiss economy, it warns that the Swiss army would depend on foreign armaments production to ensure the country’s defence as, without exports, Switzerland's arms industry would largely perish. As independence from other states is – for many Swiss – still part of their self-understanding (Switzerland is not in the EU and has joined the UN only in 2002) this argument could cause many to reject the initiative. On the other hand, revelations about the use and misuse of war materials and related goods ‘made in Switzerland’ in conflicts abroad have repeatedly shocked the Swiss public. The latest such incident involved a Swiss Pilatus aircraft exported to Chad for military pilot training, which was later equipped for and used in an attack in Darfur in January 2008. This prompted the federal council to call for a strengthening of the licensing criteria of such goods. Additional grounds for denying an export license in cases where the recipient state is involved in an internal or international armed conflict or where there is a risk that the good would be used against the civilian population were initially envisaged. However, the draft amendment of the Goods Control Act presented last month turned out to be rather vague. On the basis of the new paragraph the Federal Council may deny a license if the ‘protection of substantial interests of the country so demands’. Whether this change in legislation will indeed be enough to avoid further war materials export scandals is doubtful. Many might find this kind of response inadequate and support more radical measures, such as a total ban on war materials exports. 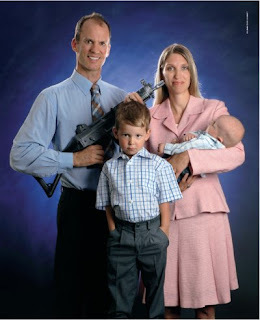 Photo credit: Image used by the women's magazine 'Annabelle' in their campaign against army guns at home. Taken from IANSA's website.